Martin Seligman, "father of positive psychology," estimates that our happiness is only 40% within our control. The majority of our happiness level arises from our genes and the life circumstances that are out of our hands. But we have enough power to tip the balance, and one thing we can do is view that empowerment glass as 40% full and forgive ourselves for the remaining emptiness--because it's not our fault--and move on. Seligman offers 21 things we can do to become happier, which all writers should do lest we fall into such despair that we don't follow through on our dreams. Some of the 21 Habits, such as taking care of our bodies and exercising, are things we can't really do while we work, but we must make time for them if we want to remain functional and prolific. Others can be integrated directly into our writing lives. The interpersonal connections, deep conversations with active listening, and laughter come rolled together with all the positive benefits of a healthy, face-to-face writing critique group or book group. We can listen to inspiring music to give us a creativity boost as we write. We can easily practice resilience by wallpapering our home offices with rejection letters. But one of the toughest happiness issues to address as a writer is the tip to "unplug." The unhealthy, addictive relationship to our electronic devices and online profiles is something writers can hardly avoid. I know a working author who still bangs out his novels on an antique typewriter, but that is simply too drastic an "unplug" for me to consider. Not only do modern writers use computers for our very craft, we have needs to do business and promote our work online. 1. Filter the poison out of your news feed. First identify the actual benefits you receive from your news feed. Important family announcements? Breaking news? Inspiring quotes? Make a list, and hide every profile and app that doesn't provide those benefits via the feed. Many people have a hard time with this because a.) it's tempting to watch train wrecks, and b.) what about the dangers of filtering out "other points of view?" I think this last issue is misunderstood. Trolling, trash, and spam are not "other points of view" worthy of your time and energy. If you want to read valid points of view different from your own, make an effort to actively include only respectful, legitimate and trustworthy sources of these "other" views, keeping in mind that debates, especially in text-only formats, are generally unproductive. MOST of my Facebook friends do not appear in my news feed now that I've cut it down to only the following categories: People whose statuses usually make me laugh (and not in a mean way, by the shock of their hatred or ignorance--that's not the medicinal kind of laughter); respectable news sources that publish mostly fascinating, uplifting, or empowering news (not whiny headlines that don't inspire me to do anything proactive); friends who regularly post such news stories or great personal experiences that I can enjoy vicariously. Warning: avoid this category if you are an envious type! People tend to post only the most flattering pictures and statuses about themselves, creating the illusion that everyone else's life is better than yours. 2. No drama applies to you too. If someone posts "drama" on your timeline, do not incur the wrath of the irony gods by posting publicly how much you hate drama or by responding with further drama. Delete, flag, block. Do not respond. If the offender is a person who is important to you in real life and you feel you must not unfriend, just delete the ugly comment and immediately make contact with the individual privately, by phone or in person. Text-only communications are an emotional wilderness of chaos in tense situations, so do not respond by private message or email or text. Think of it this way. Would you reply to a spam email? No, because it would flag the spammer that your account is active, and you would receive more spam. Same goes for drama baiters. Do not feed the trolls. Think very carefully before crafting a public message with a request for a change in people's behavior toward you online. This can be done in an appropriate and classy manner, but it's rare to pull it off. If the offender is just one person, it is never OK to write an open letter when you can make a direct phone call. The trolling "friend" will likely revel in the reward of being the subject of an open letter, whereas trolls hate to be confronted in their weak, fleshly form. An appropriate real-life confrontation will more likely end the bad virtual behavior and give you a chance to preserve or heal an existing real-life relationship. 4. Keep your timeline tidy. Don't let "friends" post extremely offensive troll comments on your timeline and leave them up there to be hurtful to others or embarrassing. Your timeline is like the sidewalk in front of your house. You wouldn't let people dump dog poop all over it and just leave it there in the name of "free speech" or whatever, would you? If you answered "Yes," you can guess why I won't be coming over to your next party or keeping you on my friends list. If you don't edit your friends with minimal standards, your friends will edit you. Another well-known hazard of the internet is distraction. Take care to distinguish distraction from "research" and "inspiration." If you are certain that what you are doing is productive and true research or inspiration, go for it. It's healthy to take a break now and then for a laugh or a moment of wonder or a jolt of excitement. Allow yourself a couple minutes--just a couple minutes--for a funny cat video, a nature slideshow that blows your mind, or any image that revs your engine. Now comes the fun part, as I demonstrate just such an indulgence. My work in progress has a lot to do with female desire, so in the name of "inspiration," below is a collage of my favorite fantasy RamManwiches. 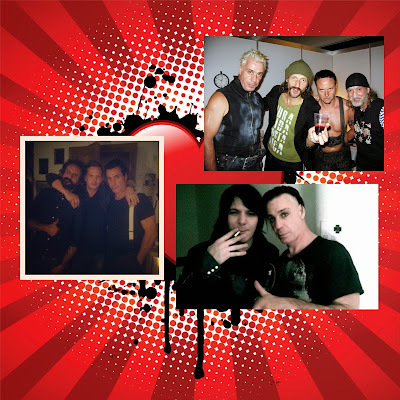 Clockwise from lower right: Till Lindemann of Rammstein and Swedish metal rocker Cat Casino, possibly having a smoke after their super hot man-slapping contest (find this on YouTube for a good time); RamMolotov (R+ Mexican hip-hop-rock band Molotov); RammBordello (R+ Ukrainian gypsy punks from Gogol Bordello--Eugene Hutz and Till Lindemann are touching thisishappeningOMG!). You're welcome. And you, fellow writers? How do you stay sane and happy in the virtual world? Share joyfully in the comments! Pictures of your favorite man-shups welcome.